​Of course, those companies told Fast Company that the data was inaccurate and also declined to provide more accurate data. Until Blue Apron goes public -and maybe HelloFresh soon after-, we won’t know for sure. But looking at the business models and current processes of the companies I am not surprised by those findings. In fact, I would have been surprised if this would have been different. The smallest box at Blue Apron is three meals per week for two people for $59.94, putting the price per meal at $9.99. Everyone who has tried meal-kits at one point knows that the food delivered can take up quite a lot of space in the kitchen, and in the fridge specifically. The small (comparatively inefficient) packages and the smallest available size of the bundles create mental overhead. A different mental overhead to planning meals all by oneself, but still. It doesn’t (yet) reduce as much mental overhead overall as the model should in theory. Earlier this year, I dug into the meal-kit business model and found it extremely tricky: loads of packaging, delivery, and ingredients costs, balanced against a need to keep prices low enough to lure consumers away from the supermarket. The 1010data numbers suggest that customer retention is yet another daunting hurdle to profitability. No wonder food startup analyst Brita Rosenheim told me that “very few, if any,” of these are likely to be “cash-flow positive” at this point—another way of saying that they’re still burning through their venture capital to stay alive. Another market-tracking firm, Packaged Facts, delivered a similar assessment in a May 2016 report. There is another interesting question in there: How do you create stickyness with meal-kits, besides by building classic brand affinity? Still, the service is undeniably popular, as several sources familiar with the internal structure of the firm note that it is on track to surpass $1 billion in revenue over the next 12 months. That annualized run rate is not the firm’s revenue projection — which could, in fact, be much higher or lower depending on its specific internal tea leaves — it is a count of what revenue would net out at over the next 12 months if its performance were the same as the last 12 months. And apart from strong sales and reasonable revenue, Blue Apron claims to have something that many other subscription delivery services do not — profitability. 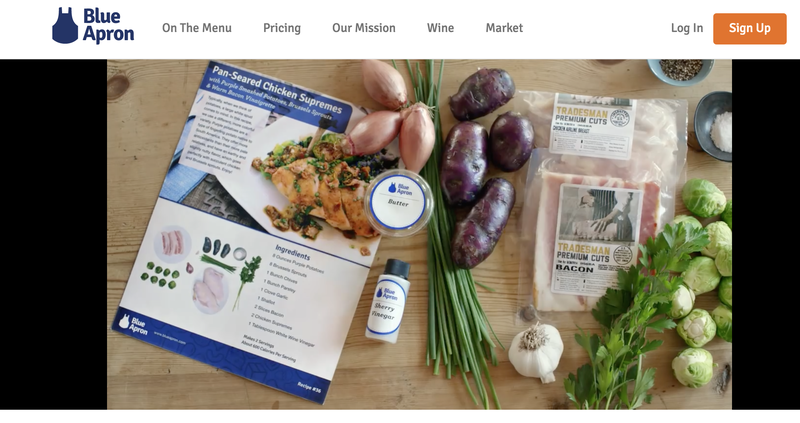 Blue Apron has raised nearly $200 million in venture capital from investors, including Fidelity, First Round Capital, Box Group and Bessemer Venture Partners, where CEO Matt Salzberg once worked. It was valued mostly recently at $2 billion when it raised $135 million last year. Despite the retention problem, 1010data found that the meal-kit industry has grown over 500% since 2014. A food-consulting firm estimated that category will account for $3 billion to $5 billion of the online food shopping business in 10 years. Blue Apron, according to 1010data, generates three times the sales of HelloFresh and about 12 times the sales of Plated. ​The general direction here is certainly correct. Which means, no. 1 on the US market will go public soon, with no. 2 most likely not too far behind.